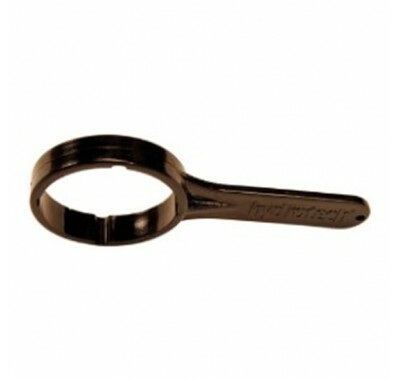 The Hydrotech 21401003 water filter wrench is for all Hydrotech 101 Series, 123 Series, HT Series, HTF Series, HT-HTF Series Reverse Osmosis and Aquafier Filter Systems. Fits all Hydrotech 3 and 4 vessel Reverse Osmosis Systems. Also fits some Arrowhead Puritap, Fillmaster, Nutripure, Sierra Springs and US Pure Water filtration housings. Use for twisting off the Hydrotech water filter housing sumps. Do NOT use the Hydrotech 21401003 spanner wrench to tighten the housing sumps. Overtightening the sump can cause damage to the o-rings and make reopening the housing sump difficult. You should only hand tighten the housing sump. The Hydrotech wrench makes replacing water filters easy.